The fragrant aroma, buttery texture, and succulent taste of a ripe pear is an experience. Unfortunately, most people eat unripe pears as the fruit is mostly picked unripe to prevent decay during transportation and distribution to retailers. The texture of ripe pears range from buttery to grainy, dry to succulent, and aromatically from mild to assertive. Unripe pears ripen at room temperature after a few days, but they lack the taste of a tree-ripened fruit. Although Canada produces considerable amounts of pears, the production fails to meet demand, therefore a significant amount must be imported mainly from the USA, Chile, Argentina, China and Europe. 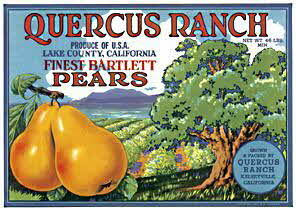 Pears are the third most important fruit crop after apples and peaches in the USA. They are cold-hardy, can grow up to 15 metres tall and prolific. Pears need a long warm growing season (150 – 180 days), thus in tropical countries ithey cannot be cultivated. The following countries produce pears; most European countries including the U K, the USA, Canada, North African countries, Japan, China, New Zealand, Australia, Chile, Argentina and Greece. Archaeologists unearthed 10,000-year-old pear seeds in Switzerland. The Greek poet Homer considered the pear God’s gift to humanity. Greeks studied the fruit keenly and made clonal selections to improve its appearance, fragrance, and texture. Theoprastus, a student of Aristotle distinguished several varieties in fourth century B C.
The size of pears varies from 60 grams (sugar pears) to well over 300 grams. The average weight is approximately 150 – 180 grams. In the second century, A D the Venus pear was famous, and is still popular in Europe. In Northern Europe monks studied and cultivated pears during the Middle Ages developing many hybrids with desirable characteristics. During the 17th century, the pear was the fruit of nobility and European courts. Painters always incorporated pears in their paintings particularly for still life and scenery themes. The “golden century” of the pear was the 18th century in France and Belgium where horticultures and scientists studied the fruit, classified it, developed new hybrids, and determined ideal terroirs. The fruit can be stored for months at O C (32F). Today there exist 2500 types of pears. Popular varieties in North America are: Bartlett, Bosc, Anjou, Comice, Winter Nellis, Kieffer, Seckel, Sugar Pear, Precoce Morettini, Eldorado, California, Packham, Rogue Red, Orient, La Conte, and Chinese Pear. Pears are mostly enjoyed out of hands, but they can be poached in red or white wine, or syrup, made to compote, canned, dried, baked, flamed, pressed and fermented for pear wine, and pressed fermented and distilled for Poire Williams or pear eau de vie. Cheese and pear are created for each other. Roquefort or Gloucester and pear is an excellent combination. Pear Helene, vanilla ice cream on a poached pear covered with chocolate sauce is a dessert for gourmets everywhere.